Name Idea: In memory of William Farrer, agriculturist, who developed a strain of wheat in the Queanbeyan area suitable for Australian conditions. Colours: Green and gold – Australian sporting colours. House Flag: Green to mast with gold wheat sheaf symbol; gold trailing. Flag is pennant shaped. 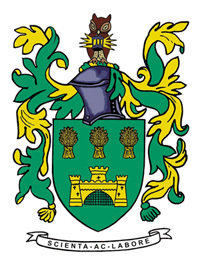 Arms: Three garbs (wheat sheaves), representing Farrer’s fame. Three – towered castle from Canberra’s arms, reminding us that Farrer’s work was largely centred on Canberra. Crest: Owl and lighted lantern – both symbols of science. Motto: ‘By knowledge and effort’ – also motto of the University of Queensland.